Well, I’m off to Peru! That’s also my way of announcing not to expect any blog/Twitter activity in the next few weeks. For all of my attempts to fake “worldliness,” I’m not worldly at all– this trip will mark my first excursion outside of North American soil. Kind of nerve-wracking and exhilarating. Between Machu Picchu and the Amazon, I’m going to learn all about backpacks, Camel Baks and water “potability” (it’s often tinted and not all that great-tasting). 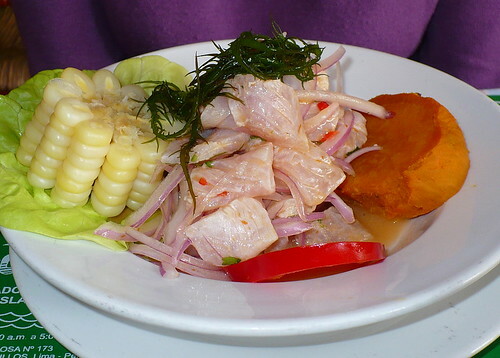 And that’s before we even get to the experiences distinct to Peru. If Anthony Bourdain has taught me anything, my tastebuds might need to do some serious acclimating. Still, pretty exciting, hopefully the blogosphere won’t be too entertaining in my absence. Filming the police is always a hot button subject. A couple of differing cases this week on that. In Augusta, Matthew Haley was arrested while filming from a public sidewalk, then interrogated again while being interviewed by local news on the subject. A much more violent case occurred in Hawthorne, California where police arrested Leon Rosby as he was filming a crime scene. They then repeatedly shot his dog upon his escape from Rosby’s vehicle during his arrest. Every case like this has its own individual considerations. The Augusta police argued that Haley was “drawing suspicion” by filming and not providing ID. The Hawthorne police argued that filming wasn’t the offense of which Rosby was guilty, but of obstructing police work with unnecessarily loud music blaring from his car. The shooting of the dog, they argued, was for the safety of the police as he was out to protect his owner. I worry about cases like these when I think about my students and any time they’re out to cover a rally, arrest or any other public event. I was asked in court about whether my students are trained to obey police commands at all times. I found the question worrisome in its phrasing and replied that students are always trained to comply with the law, which led to a trying back-and-forth, to say the least. This has become an exceedingly tricky issue in the past ten years as now just about everyone has a device with which they can film something. The right of the citizen is the most important thing in play– no one should be arrested for filming something in a public place. However, there’s also an important subconsideration: how realistic is it for police forces to approach to public filming in this manner in an era such as this? This has been the new reality for awhile…but can law enforcement adjust? It’s conceivable that if an arrest were happen on main street on AnyMajorCity, USA, dozens– nay, hundreds– will probably whip out their phones. Unless a person is standing directly in the way or path of a criminal or an officer, isn’t preoccupation with all of this incredibly unpragmatic? The sergeant in the Haley case argues that one safety consideration is planning out “escapes” for future crimes such as the Boston Marathon bombing. Yet every public place will probably eventually be well-known through filming in this era, it may just be that law enforcement have to get used to the assumption that most everyone knows the layout of most everything. The teachable moment for student press is: have your ID with you at all times. The sad part is: even if the law doesn’t necessitate you having it, trouble might still occur regardless. That is very, very worrisome indeed. If I asked you to guess where one of the most watched municipal governments in North America was…would you guess “Glendale, Arizona?” If you’re not a hockey fan, probably not. Yet it’s been the case in recent years due to the Phoenix Coyotes saga. The NHL team moved from Winnipeg to downtown Phoenix in 1996. Northern hockey fans greeted the market with suspicion and the arena was not built for hockey. The team was losing money every year so the owners sought a new arena and got one in the neighbouring city of Glendale (on the public dime, of course) as part of the consumerist experiment known as Westgate City Center. However, the team lost even more money there leaving the team owner to declare bankruptcy and throw the keys to the NHL. The NHL didn’t like that the owner tried to sell the team to a man that wanted to move it and ever since then, the city of Glendale has been forking over dollars to the NHL to “run the arena” (i.e. keep the Coyotes in town at a severe loss and to the detriment of Glendale’s bond rating). The latest chapter came on late Tuesday night/early Wednesday morning as Glendale approved a deal that might take several business degrees to understand, in which the IceArizona investment group will receive a) a loan from the NHL, b) a loan from investment banks, and c) a “management fee” from Glendale…all to be the owners of the Phoenix Coyotes. Hockey fans watched anxiously to see if the council might go in the other direction, especially as a rejection would have certainly meant relocation. A highly recommended website to learn about just how far city and state governments will go to appease pro sports teams is Field of Schemes, from the authors of book-of-same-name. It details the continuing saga of concessions– (mostly) financial and otherwise– that teams usually receive from cities and states fearful of losing status, businesses and/or revenue if their teams jump town. Yet it’s debatable how much prestige, revenue or business the Phoenix Coyotes bring the city of Glendale. The only publicity the Coyotes seem to draw is negative, even in years where they’re winning, they bleed money and arguably every business supported by the Coyotes presence could realistically exist with a minor league team (which is not cheap but is certainly much cheaper to run). In a hilariously sublime moment, one of the first citizens to plead with the council Tuesday night to agree to the deal was a Phoenix sports store owner…whose businesses aren’t in Glendale. The city has attracted scorn for laying off public employees (no, not these brave folks, but the optics remain terrible regardless) and drowning itself in red ink to pursue the Coyotes project…all for fear that it’s all or nothing because abandoning it will lead to a white elephant. The case is fraught with nationalistic tensions as well, creating an interesting fissure in the Canadian vision of American capitalism. The majority of northern hockey fans, but especially many Canadian hockey fans, have been calling for the relocation of the Yotes for a long while now. Quebec City, Markham, Hamilton and even Saskatoon all have businesspeople harbouring serious NHL aspirations and many fans are bitter that they haven’t been realized. Which, of course, then comes right back around to proposals for public money for private stadiums. The league’s return to Winnipeg has those aggrieved cities sensing a change in the wind, although ironically enough, the rumoured top contender in this year’s “move the Yotes” sweepstakes was an American northwest city planning to fund its stadium with *gasp* private money– Seattle. It’s one thing to assess these investments from a civic perspective by gauging how many dollars and cents are gained back by having major sports teams. It’s another to assess it by how many years you get out of the investment. And by the standards of North American pro sports towns, Atlanta has a bad track record. 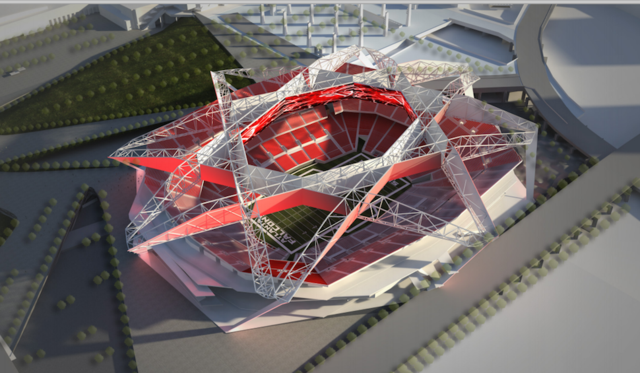 The Omni stood for less than three decades and if a new Falcons stadium is constructed, the Georgia Dome will meet a similar fate. It’s not out of line for churches and citizens to be a little bit taken aback at this venture because business owners will tell us that this building will stand for a long time but history tells a different story. It’s also dubious as to whether or not the proposed $200 million of public money will stay at $200 million and come solely from a proposed hotel tax and not somewhere else. (Bless their cotton-woolen socks, the poor ol’ NFL has graciously loaned the Falcons an equivalent amount to help out). All of which raises the question: how necessary is it to have these palaces in your neighbourhood to be a thriving metropolis? Most cities with a population over 100,000 manage to have a major sporting facility to accommodate their growth, but the level of return on the investment without pro sports is difficult to assess. One can look to the Sprint Center in Kansas City for an example of a thriving arena without a team, but then, that arena too funnels most of its direct profits to the arena operator, not the city that built it. Which makes me wonder if Coyotes fans have it right– you’re gonna pay and someone else will collect regardless, so maybe it doesn’t matter how much you spend to keep it busy. The Falcons already keep a building busy so it will take a lot to economically justify ripping it down and putting up a new one.